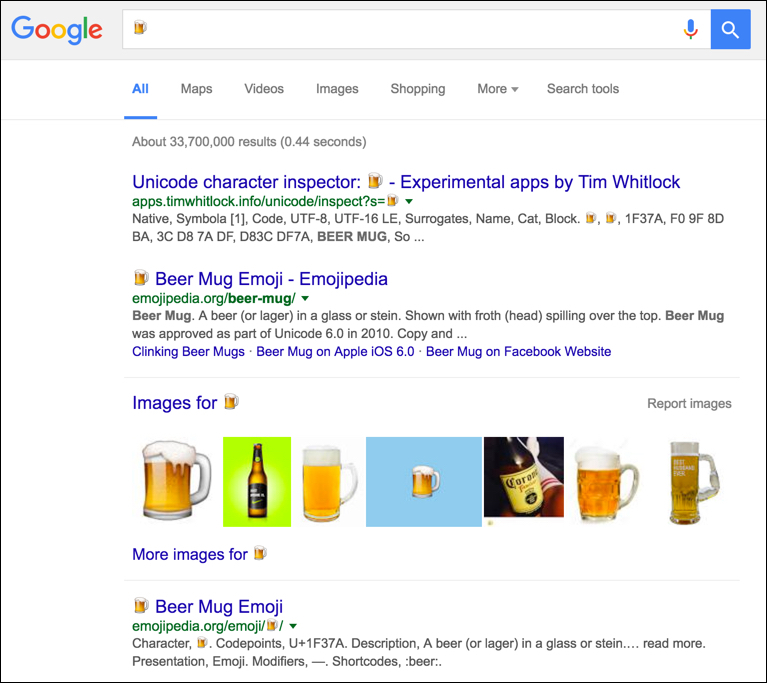 SearchResearch Challenge (10/28/16): Finding interesting uses for unicode/emoji search? ... what are you going to do with it? Today's Challenge is simple, and it requires you to be slightly clever. Can you find interesting and useful cases when a search includes an emoji or a special Unicode character? Say WHY you find this use case interesting. now that LOOKS like a strange query, but the "D" term in the query is actually a "Ꭰ" which is the Cherokee language letter for their "a" (the vowel). Thus, this query is actually looking for texts that have a Cherokee Ꭰ in them and are about a lesson. 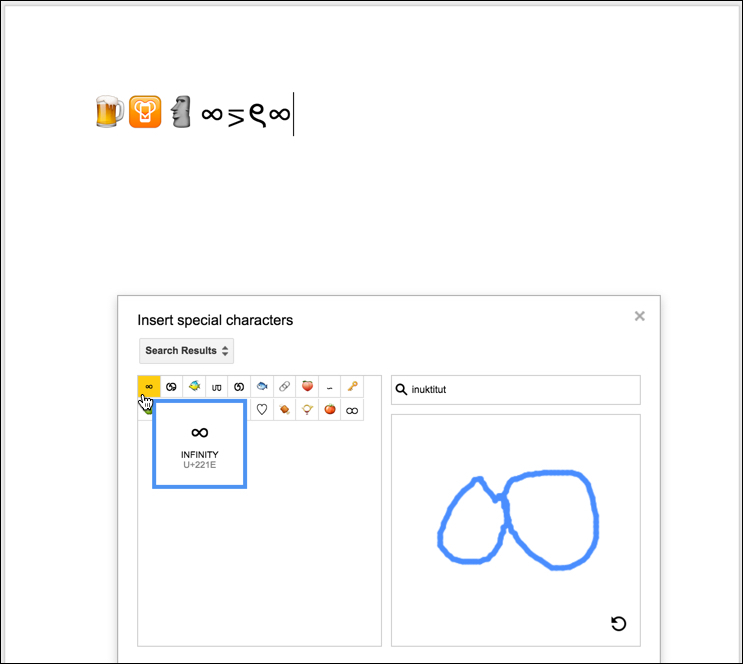 In other words, this is a clever way to find texts that are written in Cherokee (or some part of them is), and is a lesson. will find information about Inuktitut (the Inuit language). That character, ᖃ, is reasonably common in Inuktitut. So what uses can you find! Let us know. I'll be back next Tuesday to let you know what other ideas I come up with. Welcome to SearchResearch post #900! This sort of led inevitably to the SearchResearch Challenges that we all now enjoy each week. "Who IS the Silicon Valley CEO (that Gladwell mentions in his story) who coaches girls' basketball AND what company is he/she the CEO for?" But this blog started up this long, long, long list of Challenges. Some have been simple and asked a single question that was intended to teach a particular search skill. Some have been really hard.. and a few still haven't been answered yet. (I'm thinking about the Danish Optician Challenge from 2015.) Along the way we've talked about all kinds of things, from finding where the cameraman is standing, to discussions of center-pivot irrigation systems. Each post is supposed to teach you a bit more about how to search, both the tactics and the strategies of searching. I hope I've managed to do that, and that you've been both entertained and enriched in the process. 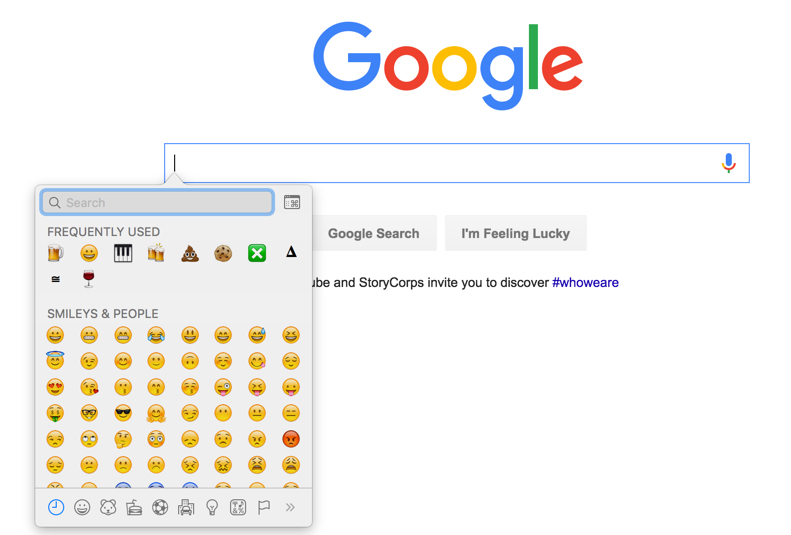 Today's post isn't another Challenge, but a note about how to search for emojis--or more generally, any Unicode character. 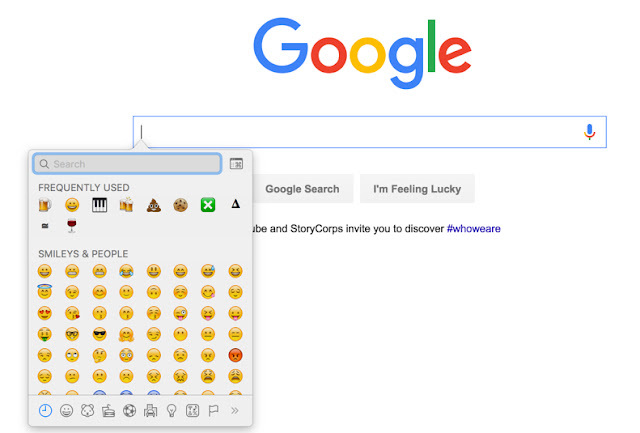 May you find all your emoji. I'll post a short Challenge tomorrow--one that's related to this note! When we get to 1000 posts, we'll talk about what's next. In the meanwhile... Search on! Answer: How healthy is the Mediterranean? And this caused me to do a lot of research over the past week. I did SO much that I'm a bit late in posting my answer. I'll talk about this later in this post, but I wanted to let you know that I haven't forgotten about this SRS post--I just got a bit caught up in it all! How healthy IS the Mediterranean? That's a bit like asking "how healthy is Europe?" The two problems are similar--the entity in question is a bit ill-defined (is Russia part of Europe? ), it spreads over a huge area, it varies tremendously from place to place (the coast of Monaco is nothing like the coast of Egypt), and what do you mean by "healthy" anyway? Here are four side-by-sides of different Mediterranean coastlines that illustrates my point. Note how much difference there is in the level of human activity, and in the surrounding ecology of the coastline. The coast varies from deep desert, to scrublands, to forests. Some are shallow and mild, others are deep and wild. It is a highly variable place. If you look at the Mediterranean as a whole, you see the scale of the Challenge. What does it mean to ask about the "health" of a body of water that's 2,500,000 square km (970,000 sq mi) with 3,750,000 cubic km (900,000 cu mi)? Any kind of answer will have to involve multiple countries and their data. south of Sicily, around the Greek islands, and the basins of deeper waters. Perhaps I should have limited my question to just the health of the Aegean Sea--after all, that's all I really saw on my one dive. The crystal clear Aegean... is it TOO clear? But that one dive made me think: Is this really the "normal" condition of submarine life around Greece? What about the Mediterranean more generally? More generally, I'm interested in what condition the Mediterranean is in these days. I'm also interested in how much the Mediterranean has changed over the past 100 years. Has it always been like this? Or has something changed recently? There are many approaches to a Challenge like this. For instance, you could collect data from many different points around the Sea and compare/contrast pollution levels, historic fishing rates, and so on. But since we have limited time, perhaps what I'm looking for is an authoritative summary of different variables that define the ocean's health. By looking at the map it's clear that trying to answer this question means looking at it from a trans-national point-of-view. 1. Work from Wikipedia outward. That is, start with the Wikipedia article and see where that leads. Look at the articles that are referred-to, and then look at articles that those articles refer to, following the reference chain outward. 2. Find a trans-national organization's report. What would such an organization be? Perhaps the UN, or maybe an international oceanographic research organization. 3. Search through Scholar for scholarly reports. Find a few and see if there's a consensus. 4. 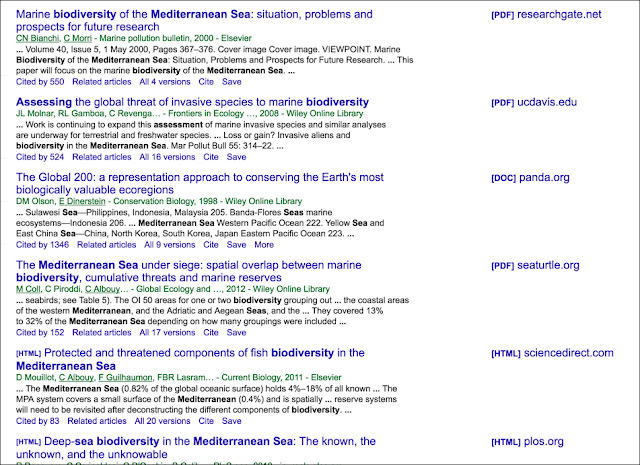 Search through a respected scientific journal that covers ecosystem science. 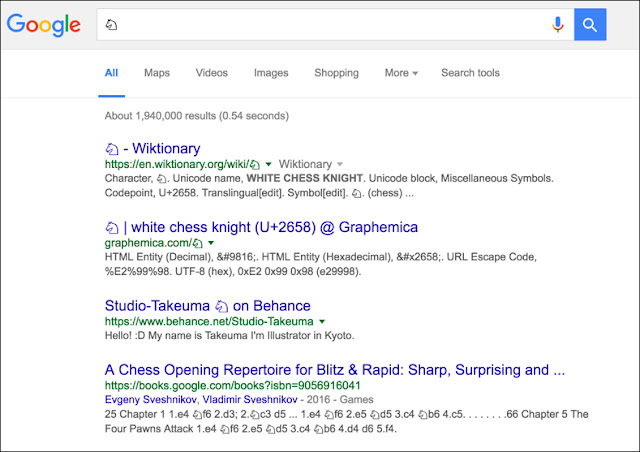 This is analogous to searching through Google Scholar, but focuses just on one journal's output on the topic. Strategy #1. Work from Wikipedia outward. In summary, from reading the Wikipedia article I learned that the Mediterranean has been heavily used for the past 5,000 years, but the last 130 years have been a time of great change as fishing, pollution, and the opening of the Suez Canal have transformed its ecosystems. It seems to be severely overfished (more than 65% of fish stocks are below safe biological limits), and the number of pristine regions are very small. One of the important functions of a Wikipedia page is to direct you toward other content that's useful on the topic. From the Wikipedia strategy I learned a bunch of useful search terms, and have an overall sense that the Mediterranean suffers from issues of species invasions, overfishing, pollution, and has suffered greatly over the past 150 years. I also checked out the Wikipedia article in other languages (Italian, Spanish, and Greek), and learned from them that invasive species is a real problem, especially with the invasion of jellyfish, and the loss of some plant species such as Posidonia (a previously common sea grass). Let's try the next strategy and see what we learn from that. Strategy #2. Find a trans-national organization's report. That query actually worked pretty well! The first result is a comprehensive report, "Blue Growth in the Mediterranean Sea: The Challenge of Good Environmental Status," which is a fairly large report by the World Wildlife Fund (WWF) that takes a comprehensive look at the development trends and status around the Mediterranean. This report summarizes data and comments from 8 EU Mediterranean countries (Croatia, Cyprus, Spain, France, Greece, Italy, Malta, and Slovenia) and gives a pretty decent analysis of what's currently happening and what the prospects are. They're a pro-environment organization, but the report seems to give a fairly balanced analysis of development and environmental factors at work. "It is likely that some pressures and, more importantly, cumulative impacts on marine ecosystems generated by the increasing exploitation of the sea will grow at a faster rate than the solutions developed and implemented to mitigate them..."
"Consequently, there is a high risk of failing to achieve Good Environmental Status in the Mediterranean Sea by 2020 for 7 out of 11 of the descriptors of the Marine Strategy Framework Directive..."
This report also shows the area around Greece (including all of the islands) as the most intensely fished region in the entire Mediterranean--which might explain some of the paucity of fish I saw in Crete. Strategy #3. Search through Scholar for scholarly reports. This is probably the simplest, most obvious approach--when you want authoritative, scholarly results--using Google Scholar is a fast way to get to this kind of information. 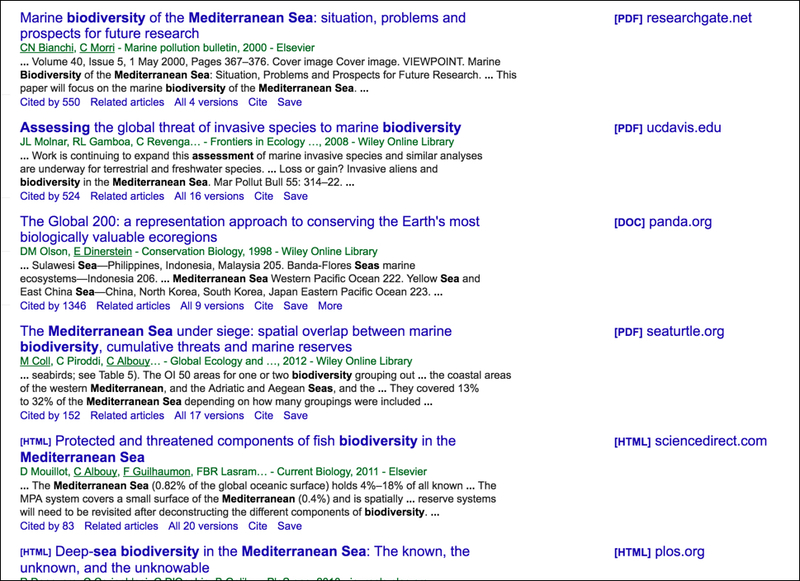 Note that each of these results is a paper published in journals like Marine Pollution Bulletin, Frontiers in Ecology, Conservation Biology, and Global Ecology and Biogeography. These are pretty serious papers that are sometimes fairly dense--but incredibly useful if you can slog through the writing. Strategy #4. Search through a respected scientific journal that covers your topic. This is confirming what we found via our other methods. Now, in an ideal research process, I'd search for disconfirming evidence, which in this case would be articles about how the Mediterranean is actually healthy and doing quite well. Using this "search for the disconfirming evidence" approach, I was able to find articles about the "healthy ecosystem" in the Mediterranean. "Fish abound in Spain’s Medes Islands Marine Reserve in the Mediterranean Sea. Unprecedented new research turned up healthy ecosystems in well-enforced marine reserves across the Mediterranean..."
So I conclude that my search for disconfirmation has failed, and that the evidence is pretty strong that the Mediterranean is a deeply compromised sea with significant challenges. If you're still reading here, kudos to you! I know this is a long post, but this was a big, complicated question with some sophisticated methods. To answer this Challenge, I used four different strategies to search for information in very different ways. I did this in order to try and find very different resources that were on the topic. My hope was to find a good set of resources that would give me the ability to get multiple points-of-view. So the Big Search Lesson of the week is that for complex research tasks, seriously take multiple approaches to the problem. See above for 4 different strategies, but it's incredibly valuable to look for your information in different ways (and don't forget to look for disconfirming evidence as well)! And... for great diving in the Mediterranean, I found out that marine reserves (especially in Spain and Italy) are great places to go. That'll have to be my next trip! Coll, Marta, et al. "The biodiversity of the Mediterranean Sea: estimates, patterns, and threats." PloS one 5.8 (2010): e11842. Bianchi, C. Nike, and Carla Morri. "Marine biodiversity of the Mediterranean Sea: situation, problems and prospects for future research." Marine pollution bulletin 40.5 (2000): 367-376. Coll, Marta, et al. "The Mediterranean Sea under siege: spatial overlap between marine biodiversity, cumulative threats and marine reserves." Global Ecology and Biogeography 21.4 (2012): 465-480.
 de Vrieze, Jop de. "Netting Better Data on Global Fish Stocks" Science, Sep 12, 2012. 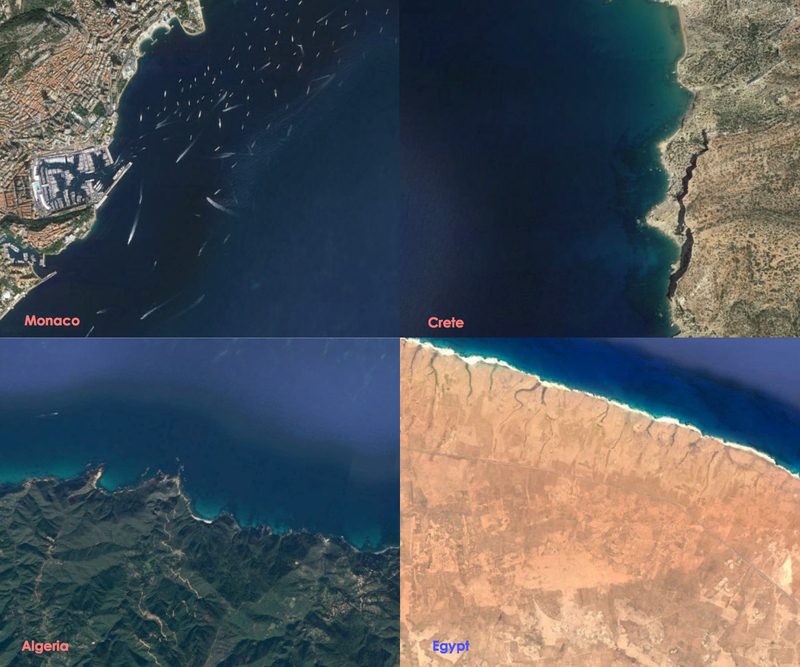 SearchResearch Challenge (10/19/16): How healthy is the Mediterranean? ... my travels took me on a tour of the Greek islands. I don't know why they weren't on my bucket list before now, but they were such a beautiful place that I'll definitely return in the future. It was that nice. 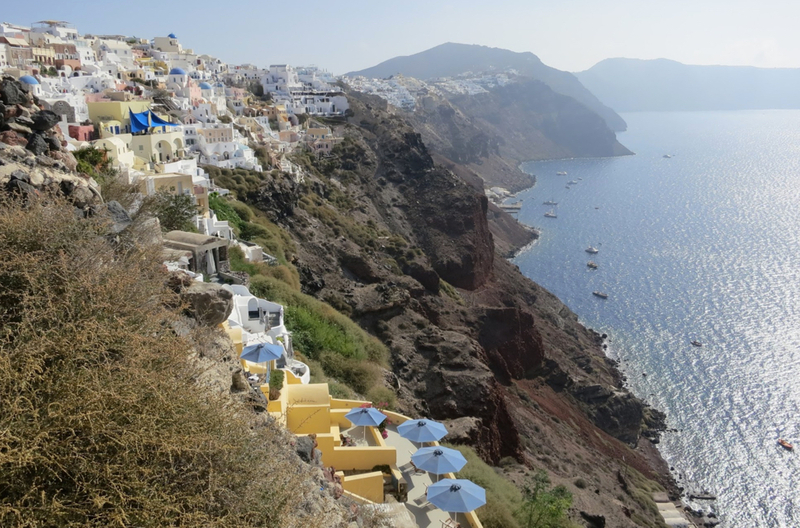 On Santorini, the cliffside town of Oia overlooks the sea. It's better than I ever imagined it to be. The water is clear, the air is pure and sweet, the food is superb, and everywhere you go there's a sense of deep history. And, as you might expect, I spent one morning going on a dive. The water wasn't just clear, it was crystalline clear. When I asked the divemaster about it, he commented that the visibility was "only 30 meters" (90 feet), on a good day "you can see at least 60 meters" (180 feet). 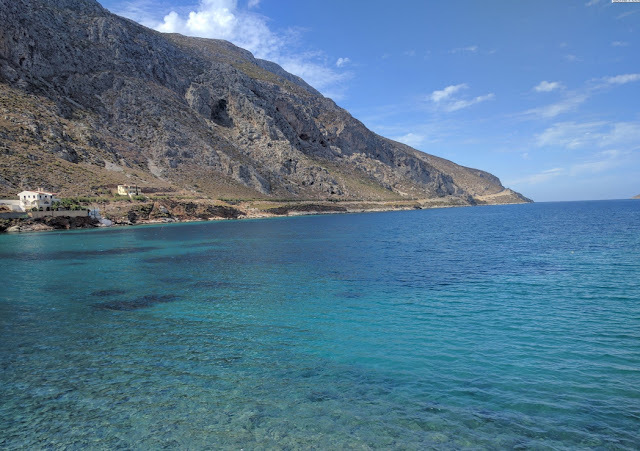 That's astoundingly good, and I was optimistic that my dive off the shores of Crete would be just amazing. As you can see, the water really is transparent (and a beautiful blue). So I was surprised when I saw relatively little sea life. A few fish here and there, a fleeting sighting of an octopus, a bit of algae, and that's about it. 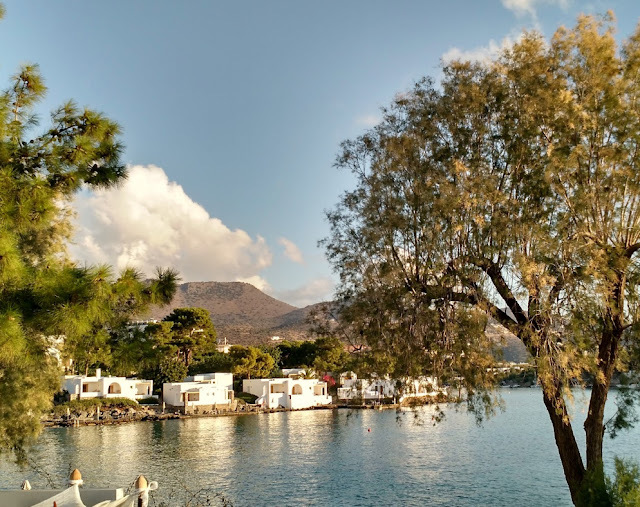 My dive was about 2 km from here, just off the coast of Crete in an uninhabited area. But it made me think: Is this really the "normal" condition of submarine life around Greece? What about the Mediterranean more generally? More generally, I'm interested in how much the Mediterranean has changed over the past 100 years. Has it always been like this? Or has something changed recently? In my quick initial check to answer this question, I found that it wasn't exactly simple to answer this Challenge. It's a large, difficult-to-frame question--but this kind of question is typical of the big research questions we want to answer. This is smaller than "is global warming a real phenomenon," but larger than "what's the best pizza in New York City?" There are also a fair number of authors who have a particular outcome that they're trying to get you to believe. I'm curious how you'd approach this kind of large-concept research question, so be sure to let us know HOW to approached the question, and how you assessed the information you found. What resources look good to you? Do you believe what they say? Obviously, you could write a book about this--but you don't need to--I'm interested in what resources you find and whether or not you believe what they say. I'll be working on this Challenge over the weekend and will post my results on Monday. Curiously, I say "Search On!" Answer: Who backs the site? An important skill to have..
... is that of knowing how to figure out who's posting this article. In other words, a really important skill is that of being able to figure out who's behind an article. Although this is something we should have learned in elementary school, it's a continuous surprise to me how often searchers DO NOT do this! This observation is what motivated the SearchResearch Challenge this week. Think of this week's Challenge as practice to learn the skill of finding out Who Backs the Site? When I saw this article my first questions were (a) WHO wrote it? (b) WHY did he write it? (c) WHAT is the reputation of the website where it was published? It's easy to figure out the author: Clicking on his author's byline in the article takes you to his personal page for his writings on Gizmodo (the website). This is list of the articles he's written, and by a quick scan, you can see that he writes many product reviews ("Best Travel Gadgets"), tech product updates ("Samsung Is Limiting Note 7 Batteries to 60 Percent to Avoid More Explosions") and random light pieces ("Diego the Loverboy Sires Over 800 Baby Tortoises, Saves His Species"). So it's clear that he's got some technology background, but how much? I did a quick search for his name [ Darren Orf ] which is, handily, a low-frequency name (i.e., fairly rare), and found his LinkedIn profile which tells me that he's now a Senior Editor for Hearst Digital Media, but was a senior writer for Gizmodo (until a couple of weeks ago). He's really a tech-journalist with a Master's degree in Journalism from University of Missouri-Columbia (a well-respected Journalism program), and that 5 people have vetted him for his fact-checking skills. That's a good sign. THAT article is written by Robert McMillan whose author profile shows him to be very focused computer technology writer. (All of his writings over the past couple of years have been technology news.) Looking at McMillan's LinkedIn profile shows that he has spent many years editing LinuxWorld and Linux magazines, both very techy journals that are dedicated to the Linux universe. A quick look at the articles he's written there show him to be deeply engaged in the security and computer-tech world, so there's a high probability that he got this one right as well. Searching for [ Gizmodo ] quickly shows us that it's a "...design, technology and science fiction website. It was originally launched as part of the Gawker Media network... [and] ... includes the subsite io9, which focuses on science fiction and futurism." With leading article (for this week) on topics ranging from Star Wars Halloween costumes, to an analysis of Juno's engine troubles (the NASA Jupiter space-craft), it's a kind of technology-light webzine. So it's not a hard-core tech magazine. What this tells me is that it's worth checking out the facts behind the article, just in case something got lost in translation. Bottom Line: The website isn't well-known for the depth of their tech writing, but the author (and original material on which he based his article) both check out as being accurate. And the article is correct: The original internet would have run out of addresses, except that a major new technology (known at IP-6) was implanted into all of the internet, and the address problem was avoided. Who backs the site? Gizmodo, the tech publishing company back the site, but the author did a good job of reflecting the internet address situation and its solution. 2. 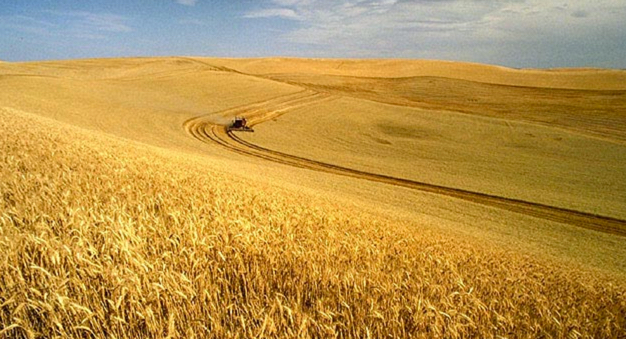 Here's an article from the EPA claiming that the federal government is suing a farmer for simply plowing his field. Is this for real? How would you assess the truthiness (and credibility) of this article? This article caught my eye with extraordinary fishiness when I first opened it up. I was expecting an article about farming regulations put in place by the EPA. I know that the acronym "EPA" stands for "Environmental Protection Agency." It's an agency of the federal government responsible for protecting human health and the environment by writing and enforcing regulations based on laws passed by Congress. To be honest, the first thing I noticed was how nice the site looked. In my experience, US government sites are a bit more... ah... clunky than this one. This article on this site looks pretty good! The next thing I noticed were some of the titles of the articles. Titles like "EPA’s Fancy Office Furniture Costs Taxpayers Nearly $100 Million" and "EPA Offers Paid Leave to Employee Caught with Pot at Work" didn't seem quite like the articles I'd expect to see on an official government web site! When I looked at the URL, I noticed it was Epafacts.com -- that is, a .COM site, and not a .GOV site, which is what I expected. "EPA Facts is a project of the Environmental Policy Alliance dedicated to highlighting the high cost of the Environmental Protection Agency’s regulatory actions and peeling back the layers of secrecy surrounding the agency’s actions." This is a bit of a subterfuge--almost as though they're hoping you won't notice. So it's not a surprise that they're very critical of the real EPA. and found several articles (Huffington Post, Food and Water Watch, The Journal of American Architects, Source Watch) that describe EPAFacts.com as a "...A front group for Washington, D.C.-based public relations firm Berman & Company..."
Is there really a connection between the Environmental Policy Alliance and Berman & Co? Well, where are they located? Notice the similarity? That's pretty convincing evidence that EPAFacts is a "project" of Berman & Co. It's not exactly an independent organization. Who backs the site? In this case, it's the DC lobbying firm Berman & Co, which has made quite a reputation for itself as an anti-environment, anti-union, and pro-energy firm. Should you believe the articles published by EPAFacts.com? Based on this analysis, I'd take a long, hard look at the claims made there. It's clear they have an anti-Environmental Protection Agency agenda. 3. A favorite topic in certain circles is the question of whether the USA has actually landed a person on the lunar surface. Here's one YouTube video that makes a series of arguments to claim that it was all a fake. How would you assess the credibility of this video? I know, I know... this is pretty silly, but lets take it seriously as an example of what you would do to check this out. Deb & Anne mentioned using the "5 W's" (who, when, where, why, what) and the CRAP mnemonic (CRAP stands for Currency, Reliability, Accuracy, Purpose (or Point-of-view)). Let's check out this video using this guideline. Who? The video author is Shane Dawson. The obvious search on his name tells us that he's an entertainer (video blogger, author, actor, sketch comedian, singer, songwriter and film director). All of his work is comedic in style. And there's no evidence in any of his online information that he's ever worked in science (let alone rocket science). When? (Currency?) Publication date is May 31, 2016. Why? (Purpose?) When watching the video, it's pretty clear that Dawson made the video to push his "conspiracy theory" (his term) about the moon landing. If you ignore the literal hand-waving and arch tone of voice, all he's doing is repeating questions that have been raised before by other faked-lunar-landing conspiracy writers. And, as you'd expect (and as the hoaxers would also expect), there's a good deal of evidence to support the lunar landing. You can see a large collection of evidence at NASA such as images of the landing sites as seen from other satellites. For example -- this image is from the Lunar Reconnaissance Orbiter (LRO), Sept 5, 2011. This is an image taken from space, looking down at where the astronauts walked and drove around during their lunar mission in December, 1972. Purpose? I'll let you look at all of the evidence in these sites, but really it boils down to credibility of the source. Can a comedy actor in a slightly bawdy YouTube video convince you that the moon landing was faked? Probably not--certainly without compelling evidence, and in watching the "evidence" presented, it's all either very marginal, or easily explained with simpler stories than the one he's pushing. If this whole topic interests you, the Wikipedia article about the "Moon Landing Conspiracy Theories" has a pretty decent writeup of the positions, the people, and what really happened. Or you could read the Snopes.com debunking of the lunar landing hoax. But I'll close this topic with another YouTube video from probably the most visible fact-checkers of our generation: Mythbusters. This video shows the Mythbusters team going to an observatory in Arizona to shine a laser at the moon and see the pulse bounce back from the retroreflector that the Apollo astronauts left on the lunar surface. And it's really hard to fake that laser pulse returning from the moon after the right amount of time. 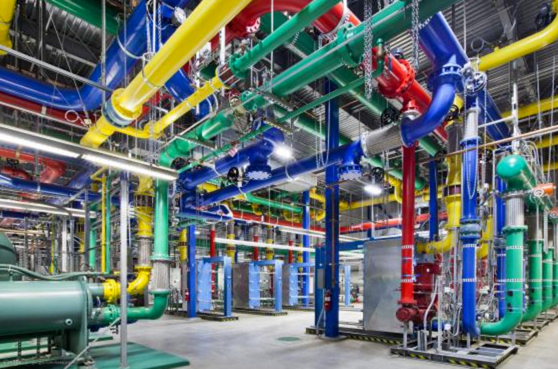 We live in a time when a huge amount of information is available via a quick Google search. And we also live in a time when it's really easy to publish almost any crazy notion and have it seem authoritative. That's why the skill of assessing credibility is such an important skill to have. It's really not optional. As we saw, the simplest queries can lead to content that you should definitely checkout before accepting as fact. You might ask why Google (or Bing, or other search engines) don't just filter out the "obviously wrong" content. The reason is a bit complicated. At this point in time, it's very hard for search engines to know exactly what is true or not. As an example, the dihydrogen monoxide (DHMO) site is really a brilliant spoof site because most of what's claimed on the site is actually correct. For instance, DHMO is dangerous because "Death [can be] due to accidental inhalation of DHMO, even in small quantities." That's actually true--water inhalation can kill you. Or, DHMO is "Often associated with killer cyclones in the U.S. Midwest and elsewhere..." Again, that's true, but we don't normally think about water in that way. The problem here is that the tone of writing on the site is explicitly exaggerated for effect. And that exaggeration is currently a difficult thing for search engines to parse. What's more, it's really difficult to say with certainty what's true with respect to many topics. Are fighters in Syria "freedom fighters" or "terrorists"? It depends on which side you're on. Is acupuncture an effective medical treatment, or is it purely a placebo? Again, it depends on what you accept as evidence (and, to a certain extent, where you're doing the search from). So for the time being, the responsibility for determining whether or not to believe an article, a book, or a web page result is still really up to you. This has always been true. But now that it's so cheap for anyone to publish (by putting up a web site), there's a lot more questionable content. You, as a responsible SearchResearcher, need to know this. We'll talk more about how to assess online content in your online research--but don't ever skip this important step!! Answer: Who made the mosaics? Answer: What IS that below?